The Austin Jewish community just got a piece of history from the 19th century. It comes from another dwindling fellowship in Texas. The B'nai Abraham Brenham Historic Synagogue came in three pieces to Austin, where the Jewish population has quintupled in the last 30 years. Jews celebrate Simchat Torah today. This festive holiday marks the end of the annual cycle of Torah readings and starts off the new cycle. Jews in Austin just recently got two historic Torah scrolls to read from. The scrolls, along with a 19th century synagogue, came from a disappearing Jewish community in Brenham. A community that embraced its Texas garb. 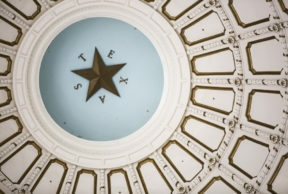 You see, since Jews arrived in Texas – most of them back in the 19th century, they wanted to fit in, says Bryan Stone, a history professor at Del Mar College in Corpus Christi. “They accommodated to some extent the culture and place they came to, and if that means boots and hats and a drawl, they’ll pick that up,” Stone says. I went to a ceremony, on Aug. 30, 2015, that had Klezmer music outside of Austin’s newest synagogue, which is actually more than 120 years old. It came from Brenham, moved here in three pieces on the back of a truck earlier this year. They rebuilt it on Austin’s Dell Jewish Community Campus, where the ribbon-cutting ceremony took place. Leon Toubin, 87, was in the crowd. He remembers what it was like to pray in here as a kid. Back in Brenham, he and his wife, Mimi, were its only remaining caretakers. The rest of the congregants moved away or died off. The Toubins made a painful decision to move the white wooden synagogue out of Brenham to a place where it could thrive again. It’s certainly unusual. Synagogues rarely get saved for their original purpose when the congregants are gone, says Bryan Stone of Del Mar College, who wrote the book “The Chosen Folks: Jews on the Frontiers of Texas.” Stone says Brenham isn’t the only historically Jewish community to decline, and eventually disappear. “We could mourn the loss of small Jewish communities, but then that’s a lot to mourn because there’s a lot of them and there’s very few left – not just in Texas but all over the country,” he says. “In Tyler, there was a rabbi called Solomon Greenberg, and he saw that his neighbors were smoking hams, so he smoked kosher turkeys,” Weiner says. He started in the late 1930s. Today, the business he started, Greenberg Smoked Turkeys, still exists in Tyler. Another example is in Marshall, Texas. Jews used to have a synagogue there, built in 1900. Its sisterhood raised money to build an annex in 1939 by selling Mable Stein’s hot tamales. “Instead of, let’s say, something Jewish,” Weiner adds. Corsicana still has a synagogue from the 1890s that has twin onion domes and is on the National Register of Historic Places. Now it’s a public space for everybody, though. “When people visit Corsicana they know, without even reading about it, that once this was a center of a strong Jewish community,” she says. Meantime, back in Austin, the Jewish community here has quintupled in the last 30 years. Brenham’s loss is Austin’s gain. Orthodox Jews here now have a synagogue to use – the one moved here from Brenham. This month, the building will see its first wedding in more than 75 years.